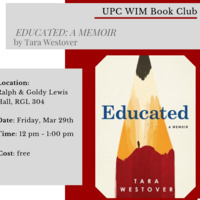 Our next book pick is Educated: A Memoir by Tara Westover. We’ll meet on Friday, March 29th at Noon, in RGL 304. Reminder, this is a brown bag event. So while no lunch is provided you can bring your lunch if you want! If you’ve already been to a book club event, just check your email for the Outlook calendar invitation. If this is your first time, yay! Welcome, we look forward to seeing you. Click on the “book now” link and fill in your contact information to checkout and we’ll see you there.